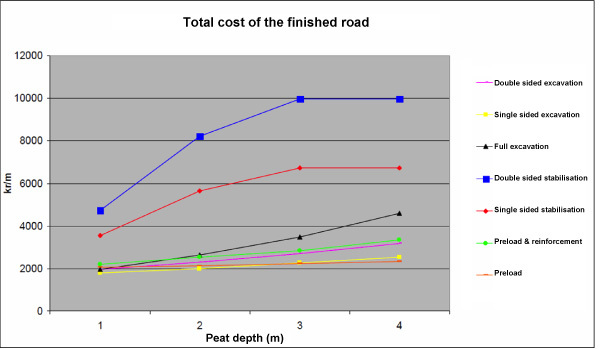 This section will summarise the most common construction methods for low volume roads on peat. Further information on the methods is given in the ROADEX II report “Dealing with Bearing Capacity Problems on Low Volume Roads Constructed on Peat”. The simplest method of dealing with peat is to avoid it, go round it, do not cross it. This may seem obvious at first glance but it is sometimes overlooked when planning a route corridor when the design focus is on other things. But if circumstances permit (alignment, environment, economics, etc) avoiding the peat is a sensible option. Excavation and replacement of the peat below the road line is the safest option for constructing, or improving, a road over peat other than by avoidance. In this method all of the weak materials under the road line are excavated out to a suitable firm layer and the embankment constructed on the exposed sound foundation, preferably with non-cohesive material locally won on site. Where it can be used the method is a dependable way of constructing an acceptable road across peat with the minimum risk of settlement or shear failure, provided that all of the peat is excavated down to the sound load bearing layer. In these circumstances the bearing capacity of the new embankment will be dependant on the method and materials of construction. Most new major roads in the ROADEX countries are built with the excavation method. Peat excavation and replacement is however only generally economic for the shallower depths of peat where excavation quantities are likely to be small. Experience in the ROADEX countries suggests that the economic limit for the excavation method normally lies somewhere between 3 and 4 metres of peat for public roads. The actual economic depth at a particular location will depend on the local parameters, e.g. the type of peat, the area of peat, the cost of the backfill material, availability of spoil areas, etc. (Note: Wind farm developers in Scotland currently consider the economic depth to be 1.0m to 1.5m of peat.) What can be said with some certainty is that after 4m of excavation it will become increasingly more difficult to keep the peat excavation sides stable. The ‘progressive displacement’, or ‘displacement’, method is normally used where the depth of peat to be replaced is beyond the economic limit for excavation, and the weight of the intended road embankment is expected to be sufficiently heavy to displace the type of peat below. The method is suitable when the soil stratigraphy consists of peat on top of soft gyttja and clay layers. It is not however usually suitable where the soil consists of only fibrous peat as the fibres can hinder displacement, see also 7.4.2. In this method a standard embankment is constructed up to the edge of the peat deposit and then driven across the peat by end tipping, normally helped by a surcharge at the point of the advancing embankment to maximize the local displacement weight. 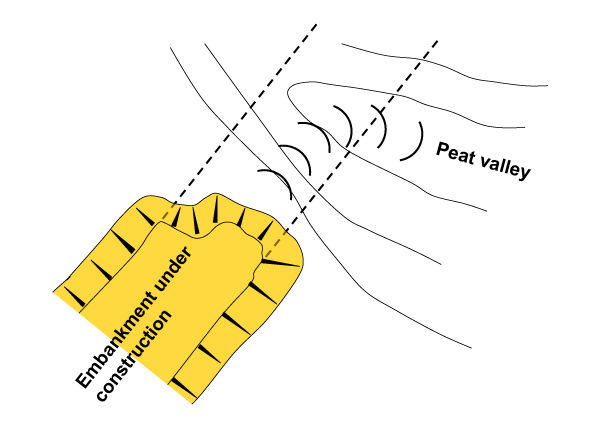 The effect of the combined weight of the embankment and the surcharge is to cause a shear failure in the peat/soft soil ahead of the embankment, and a ‘displacement’ of the peat/soft soil to the side of the advancing embankment. A disadvantage of the progressive displacement method is that waves of displaced peat/soft soil will be formed at the sides and front of the embankment as it is being placed, and these can act passively to prevent the displacement continuing. 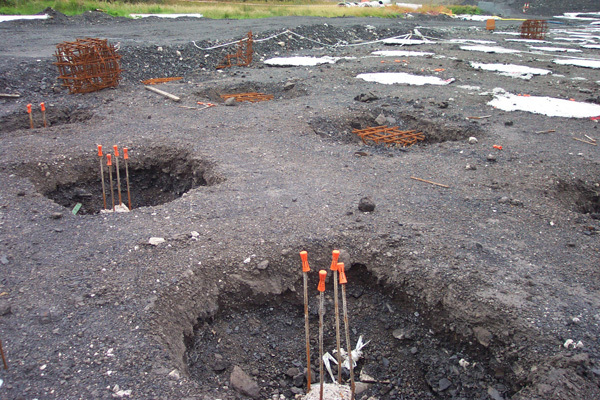 Displaced peat/soft soil can also have an affect on adjacent structures and buildings, even at some distance from the main axis of the displacement. Adjacent structures, within 5 times the peat/soft soil depth, should be identified and considered before the works commence. All of these elements need to be known and quantified before the quality of the displacement can be assured. As with the replacement method, care needs to be taken to avoid trapping pockets of peat/soft soil below the embankment during the displacement drive. Progressive displacement is best used when it is known that the topography of the underlying hard layer can permit the embankment to move forward downhill without trapping pockets of peat/soft soil. If the direction of advance of the embankment can be controlled ‘downhill’ it is possible to prevent situations that would cause peat or other soft material to be trapped under the embankment on the ‘uphill’ side of the direction of travel. It is normal practice to take proving cores through the completed embankment at the end of the displacement to check if the displacement has been successful. 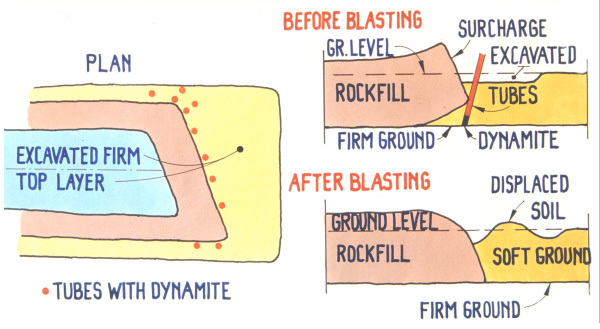 Where peat/soft soil pockets are detected it is usual to either allow time for the trapped peat/soft soil to consolidate under an addtional surcharge, or to blast out the material from below the embankment by strategically placed explosives. 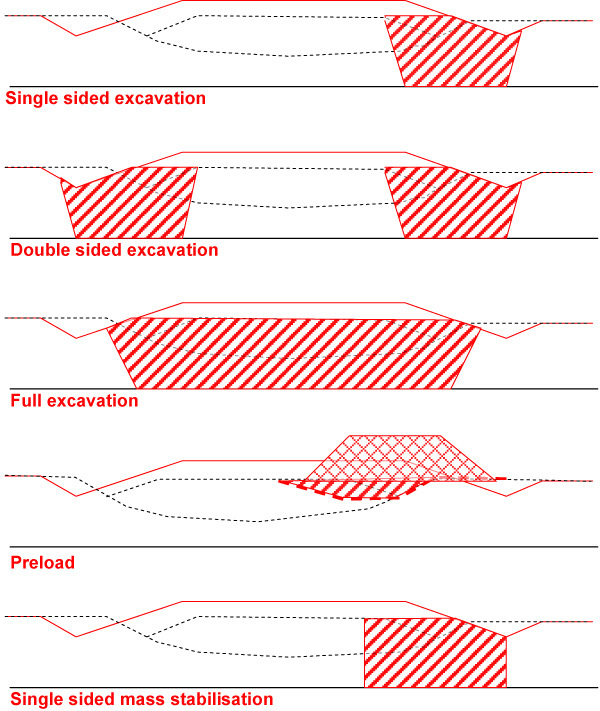 “Partial Excavation” differs from progressive displacement method in that a manageable depth of peat is excavated in front of the nose of the new embankment to reduce the amount of material to be displaced. Note: The excavator can, if there are stability problems, also be placed on the same side of the pit as the track loader. The method is normally used for the construction of wide embankments where the underlying peat/soft soil is deep and beyond the limit of economic excavation. Under these circumstances standard progressive displacement techniques may not be fully effective due to the need to place sufficient weight across the full cross-section to achieve a displacement. The partial excavation method is particularly useful where the top layers of the peat deposit are very fibrous or woody. Where these layers exist they can act as a surface reinforcement to the peat and resist the displacing forces of the embankment. In these circumstances the fibrous layers can be excavated out and the remaining peat displaced by the embankment assisted by a surcharge. 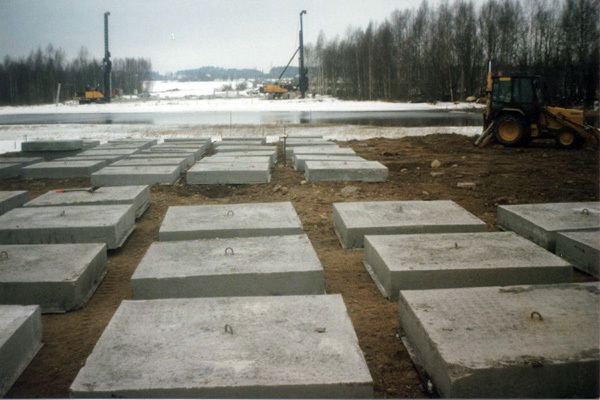 This method has been successfully used in Finland for replacement depths of 10-12 metres. Where displacement is difficult it can sometimes be assisted by water jetting or blasting to reduce the strength of the peat. Water jetting involves pushing water jet lances into the base of the peat ahead of the embankment front to locally increase the water content of the peat, and reduce its shear resistance. The lances are then slowly withdrawn whilst the water is being pumped into the ground. This maximises the volume of peat treated. These methods are described in greater detail in the ROADEX II report “Dealing with Bearing Capacity Problems on Low Volume Roads Constructed on Peat”. 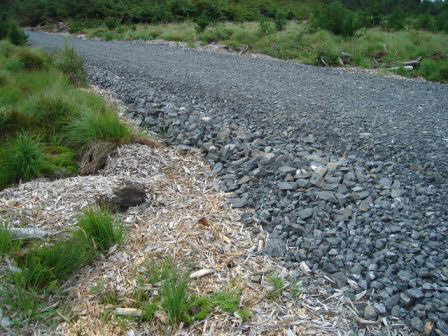 This section deals with methods that use the strength of the in-situ peat to support the weight of the new road. These methods eliminate the need to transport large quantities of fill material and are becoming increasingly more attractive to engineers as road construction budgets reduce and more cost effective solutions are sought. Recent environmental and waste minimisation regulations also add to the arguments for using methods that build on the peat in place. Stage construction means that the road is constructed in layers, or “stages”, and each layer is only placed when the underlying peat is strong to support it without failure. 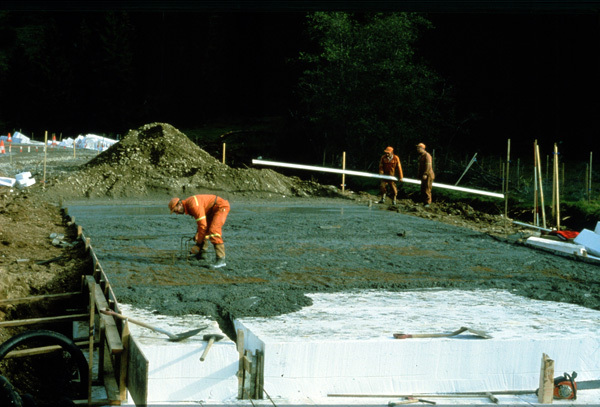 The first layer on the ground in stage loading is normally laid thick enough to withstand the immediate construction traffic, yet thick enough to prevent local shear failure of the peat below. Diagram showing the effects of a 3 stage construction process. Each layer is only laid when the preceding layer has reached the required strength to support the new load. For a fibrous peat this means that it is normally safe to have a first stage load of around 20 kPa as a working platform (approx 1m of gravel), and subsequent layers of fill only placed on this when 50-70% of the primary consolidation of this layer has been reached (see Chapter 5). The same system is similarly used for the next layer(s), and any final temporary surcharge. Fibrous peats are ideally suitable to stage loading as they have excellent initial properties of high compressibility and permeability. Amorphous peats can also benefit from the technique but the timescales for the stages will be longer. The rate of stage loading is normally determined by the rate of dissipation of porewater from the peat matrix. This can be estimated from the basic peat properties but is best done by monitoring the settlement with settlement plates, or by directly reading of piezometers in the field. Significant settlements can be incurred during the stage loading operations and these should be known and their effects understood with reasonable accuracy at the design stage so that they do not come as a shock to the engineering staff on site. Preloading is generally considered to be a cost effective solution for peat depths of up to 4m. The method can of course be used for greater depths than this but the surcharge required will be that much larger and take longer to achieve the desired effect. 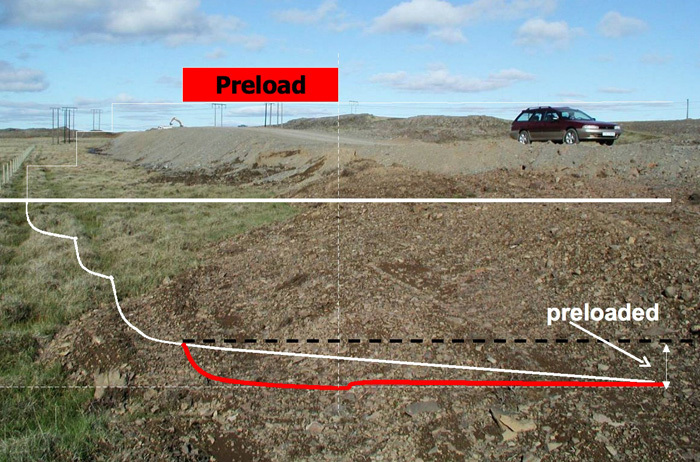 Preloading is a method that improves the strength of peat by accelerating its consolidation so that the peat can be capable of supporting the intended load earlier. Peat is well suited to preloading as it has a very high permeability in its natural state and compresses in a relatively short time when loaded. The principle is relatively simple. A load in excess of what is required is placed on the peat and allowed to settle until it reaches the predicted settlement. Once this settlement has been reached the excess load is removed and the service load left on a strengthened foundation. Preloading with a surcharge is generally considered to be the most economical method of road construction in the Northern Periphery, and results in what is commonly called a “floating” road. The method is normally restricted to thin embankments close to the natural ground, usually limited to an embankment height of 2-3m above the adjacent peat level. The surcharge load is usually constructed using temporary stockpiles of construction materials, such as sub-base or roadbase materials, planned for use elsewhere on the road. The cost of using these types of surcharges is therefore cost neutral in the overall costing of the project. The amount of surcharge needed to achieve the desired settlement will be a function of a number of things such as the type and depth of peat, its water content, the ground water level, distribution of load, etc. Each installation will be unique requiring a geotechnical assessment of stability, settlement and increase in strength. Experience in Sweden suggests that the unloaded in-service embankment weight should be 80% of the surcharged embankment after taking buoyancy effects into consideration. This equates to a nominal 25% surcharge over the weight of the final embankment ignoring the effects of buoyancy over time. A good preloading exercise will aim to maximise the length of time the preload is in place and have a large unload, preferably more than 0.5m above the finished road level. 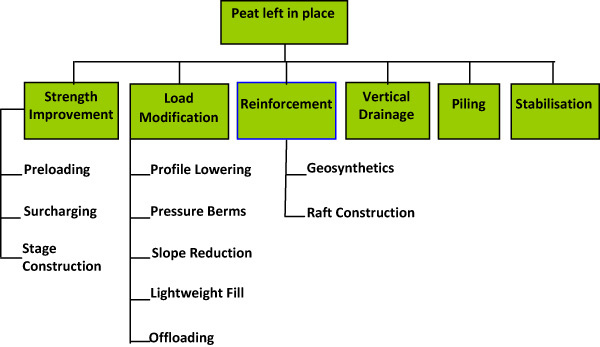 The ‘load modification’ group covers those methods that alter the load distribution of a road embankment to better suit the existing strength of the peat. ‘Profile lowering’ means that the route vertical alignment is lowered at the design stage to suit the strength of the underlying peat (normally no more than 3m above the peat level). This method can be extremely cost effective both in time and materials used and is certainly worth considering for schemes crossing areas of peat. Stabilising berms, also known as ‘counterweight berms’ or ‘pressure berms’, are used to widen the base of an embankment to distribute the embankment load over a greater surface area and increase the factor of safety of the embankment against slip failure. As with all structures over peat a stabilizing berm must firstly satisfy its own stability requirements and be constructed, and monitored, in stages to remain in a stable condition at all times. By widening the base of the embankment and providing a counterweight to the main embankment load the failure slip circle of the combined arrangement can be forced deeper and longer into the peat foundation so improving the overall stability. To be effective a berm should be sufficiently wide to ensure that its centre of gravity acts through the counterbalance side of the slip circle. Any material can be used for the construction of a stabilizing berm, even excavated peat, but they are best constructed at the same time as the main embankment using the same construction principles. 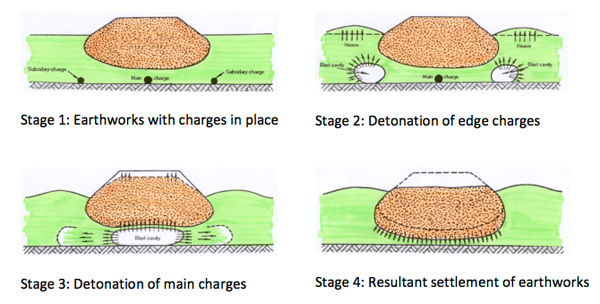 ‘Slope reduction’ is similar to the addition of pressure berms and is used to produce a wider embankment, a greater distribution of load over the foundation area, and a longer more deep seated potential failure slip circle in the underlying peat. In this method the side slopes of the embankment are flattened to a shallower gradient to widen the overall width of the embankment across the peat. Lightweight fill is normally used to reduce the overall weight of an embankment and thereby reduce the permanent stresses on the foundation. Embankments constructed with a lightweight fill core are usually installed in conjunction with a temporary surcharge load to accelerate consolidation and settlement. 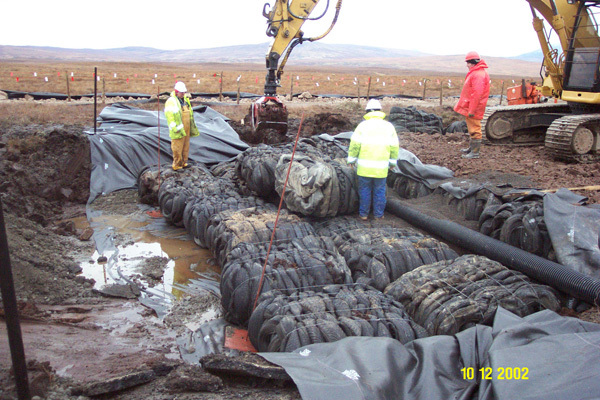 Construction of a replacement lightweight embankment using waste tyre bales. Once the designed settlement has been reached the surcharge is removed leaving the finished embankment on a strengthened subgrade. Lightweight Expanded Clay Aggregate 300-900 650-1200 Manufactured product. Lightweight aggregate produced by heat expansion of clay pellets. Range of densities due to water absorption. Normally requires 0.6m of road construction above. May be difficult to compact if unconfined. Pulverised fuel ash 700-1400 1300-1700 By-product of coal fired power stations, Naturally cementitious, especially useful in backfills to bridge abutments. Slag 1000-1400 1400-1800 By-products of heavy industry, steel furnaces, etc. Generally at the ‘heavy’ end of lightweight materials. Leachates can pose environmental problems. Aerated slag 500-1000 1100-1700 Foamed by-product formed by quickly quenching molten slag in water. 1400-1700 Natural material (particularly useful in Iceland). EPS Expanded polystyrene 20 100 for design Manufactured product. Extremely light, generally produced in blocks, relatively expensive, 100kPa minimum compressive strength. Installations are usually capped with a concrete slab. Requires protection from petrol, fire and UV light. Concrete waste 500-600 750-100 Waste concrete products from precast concrete production, e.g. broken blocks, no fines concrete, etc. Compressed peat bales 200 600-800 Past installations still exhibiting 20% buoyancy after 10 years submergence, not generally available. Horticultural peat 200 500-800 “Garden peat bags”, laid flat as bulk fill, assume 800kg/m3 for long in situ density. Foamed glass “Hasopor” 100-500 100-500 Recycled glass product manufactured from waste cathode ray tubes, stable, inert material, compressive strength 6-12 MPa. Waste tyres bales 500-650 500-650 Waste tyres compressed into bales and bound with galvanized wires. The low densities of some lightweight products are not however always a benefit in embankments over peat as their light weight can pose buoyancy problems particularly in location with high water tables. The most popular lightweight materials today are LECA and EPS. The major advantage of EPS is its low density of 20 kg/m³ although it is generally given a higher design value of 100 kg/m³ for stability and settlement calculations to allow for some water absorption over time. EPS blocks are easy to transport and handle (up to 100m³ can be transported on a single vehicle) and their only disadvantage, other than their production costs, appears to be that they can be susceptible to petrol and chemical attack. This is usually catered for in careful detailed design. EPS for roadworks is usually specified at a compressive strength of 100 kPa to limit local pavement deflections under wheels. The completed installation is normally capped with a 100-150mm reinforced concrete slab topped by a 500mm gravel road base to try to tie the construction together and provide a heat storage mass to counter any variations in icing conditions along the finished carriageway between lengths of normal construction and EPS blocks. Lightweight forestry by-products such as bark, woodchip and sawdust wastes from the timber industry have regularly been used a lightweight fills in the ROADEX Partner areas across the Northern Periphery. These materials are normally installed with a covering layer of a low permeability material, such as clay or topsoil, to keep them moist and isolate them from the effects of the atmosphere. When forest by-products are left exposed to air they can decay and be prone to spontaneous combustion if incorrectly handled. ‘Offloading’ basically involves the removal of heavyweight material from an existing road construction and its replacement with something lighter. 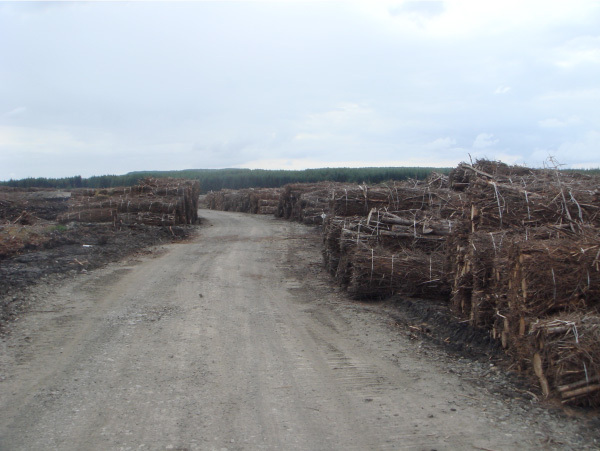 The aim of offloading is to produce a reduction in load on the underlying peat down to less than its existing bearing capacity. Normally designers aim to achieve a reduction of load of 1/2 to 1/3 of the original embankment. If this can be achieved the new carriageway can be expected to be relatively settlement free for the rest of its service life. A great deal of discussion has centred round geotextiles and their application to the two types of road construction over soft ground, i.e. 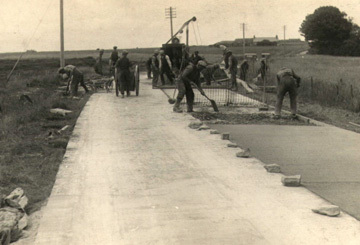 the ‘thin’ construction of roads and pavements and the ‘thicker’ construction of embankments. What is generally accepted is that for thin fills the geotextile will act as a separator and filter, and the particular material should be chosen with these properties in mind. In the case of thicker fills the geotextile or geogrid will perform more of its true reinforcement role and a suitable grade of reinforcement material should be selected. Here it will be necessary for the designer to establish that there will be sufficient friction generated between the geotextile and fill and underlying soil to resist the forces created. 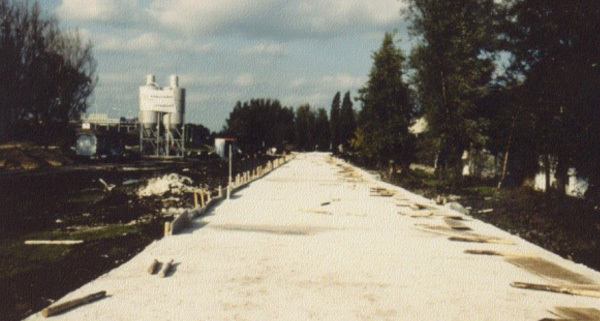 The installation of the reinforcement form of geotextile will not affect the long term consolidation settlement of the embankment, or of its overall factor of safety, but it does have some appreciable short and medium term benefits. In particular it has the advantage of assisting the local stability of the embankment during the construction phase by decreasing the rate of spread of the load from the fill material on the surface until the foundation soil is strong enough to support the load itself. The geotextile should however only be considered as a temporary supplement to the strength of the foundation soil to allow time for the soil to gain sufficient strength to support the embankment in the long term. 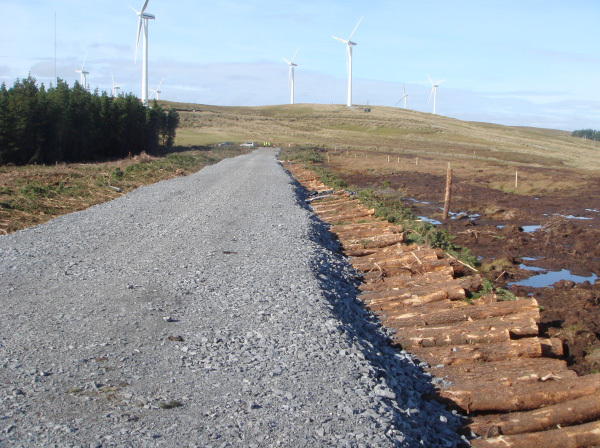 The use of geogrids in low volume roads over peat is becoming increasingly popular, particularly in new roads servicing wind farm developments on deep peat. 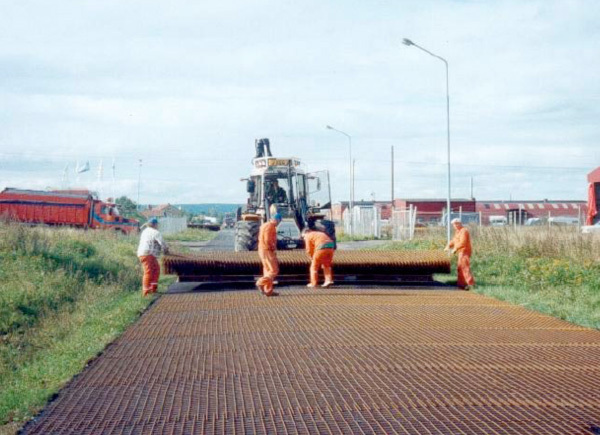 [Link to “Floating Roads on Peat”] A wide range of geogrids are available for this, from a host of manufacturers in different materials and formats. All essentially work on the principle of “interlock” between the geogrids and road base aggregates under the action of dynamic traffic loads and settlement. Interlocking forms a composite stabilised layer between the geogrids and aggregate, creating an increased stiffness in the geogrid that helps to distribute the loads over a wider area than that of a road without geogrids. A geogrid stabilised floating road does not eliminate settlement but the geogrid makes it better able to distribute the loadings across the width of the geogrid and as such helps to reduce differential settlement over weaker areas. The key to achieving effective interlock with a geogrid is having the correct size and shape of aggregate relative to the geogrid being used. This will depend, among other factors, on the relative geometry of the geogrid and the aggregate. Ideally, there should be such an intimate match between the geogrid and the aggregate that the interlocked “composite layer” is created. Round gravels, moraines and large stones are not therefore generally suitable for use in the interlock layer. “As dug” material may be suitable for use in the interlock area provided that it is sufficiently well graded and angular to produce interlock. 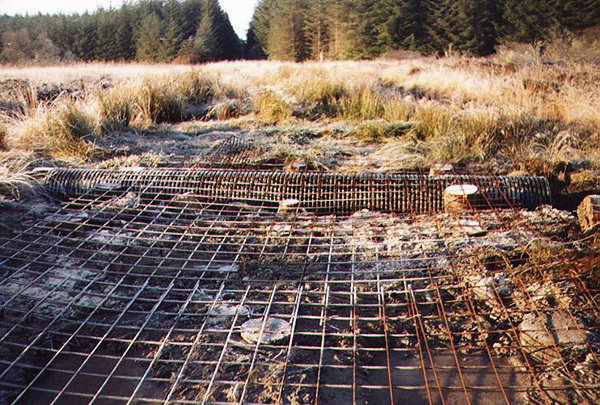 A system of two geogrids usually produces a stiffer road structure than that of a single geogrid and this can help to minimise differential settlement across the peat. 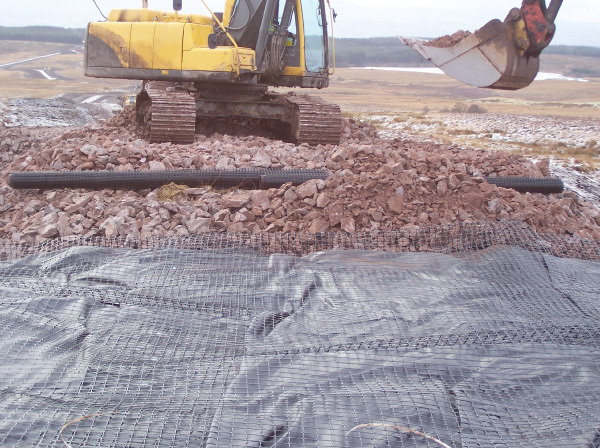 A separator grade geotextile should be used below the base geogrid where there is the possibility of fine materials migrating into the aggregate layer. Fines from the subgrade soil can reduce the effectiveness of the geogrid/aggregate interlock and consequently affect the performance of the finished road. 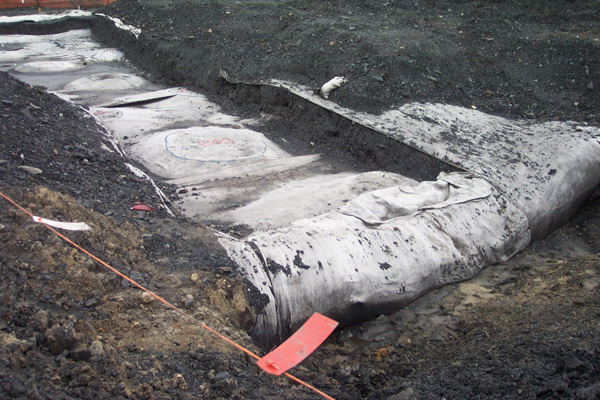 Subgrade soils with a fines content >15% should be considered as a fine material and treated with a separator geotextile. 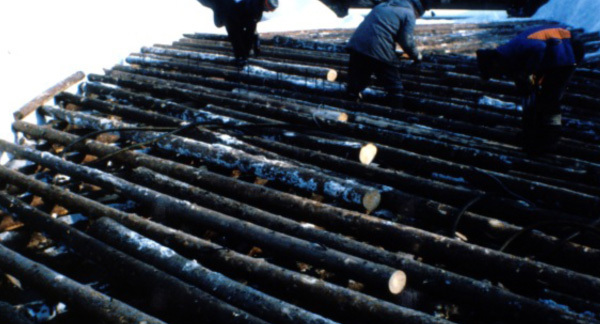 Timber raft construction is the oldest method of strengthening embankments over peat. The technology has been around for many years and involves laying an interlocking platform of local forest materials on the peat surface to support and distribute the loads of the new embankment until such time as the underlying peat can gain sufficient strength to support the embankment on its own. Historically there have been many types of timber reinforcements, from simple brushwood mattresses and fascines through to substantial designed steel pinned grillages fabricated with selected timber logs. All have the same aim of preventing local punching shear of the fill material into the peat and distributing the embankment load across a wide surface. The simplest method uses bundles of locally available woody material (fascines), as the structural elements. These are laid alongside each other on the peat surface before being overlaid with a suitable filling material. Timber grillages are the heavy equivalent of fascines and are designed to provide a resistance to bending in the base of the embankment. In their simplest form they can comprise a single platform of logs (corduroy) laid side by side at right angles to the road line. Grillages can also be designed as structures of logs laid orthogonally to each other (generally 60º) and spiked together with steel pins. Experience has shown that timber mattresses and grillages must be pushed down into the water table within 6 months of installation to prevent them decaying. If they are not completely submerged below the embankment it is likely that the elements will rot and the platform decompose. Timber grillages are currently not so popular as geotextiles or geogrids in the Northern Periphery due to their high labour input and the cost of timber, but they can be competitive if suitable timber is available locally. They should not be forgotten however as many roads in the Northern Periphery still rest on grillages and these will require maintenance or widening in the future. Reinforced concrete rafts or slabs were used very successfully in Scotland and Ireland from the 1920’s through to the 1950’s. They were generally built in a series of slabs 200mm thick, doubly reinforced with edge strengthening and were either constructed directly on to the peat surface or on top of a regulating layer of sub-base material. They were stiff structures, much more so than other strengthening systems such as mattresses, geosynthetics or grillages and needed minimum road construction layers to distribute the traffic loads. Many of these concrete rafts still remain in service over deep blanket bogs deposits in northern Scotland providing a stable load bearing platform for modern traffic. A modern derivative of the reinforced concrete raft is the lightweight “foamed concrete” raft. 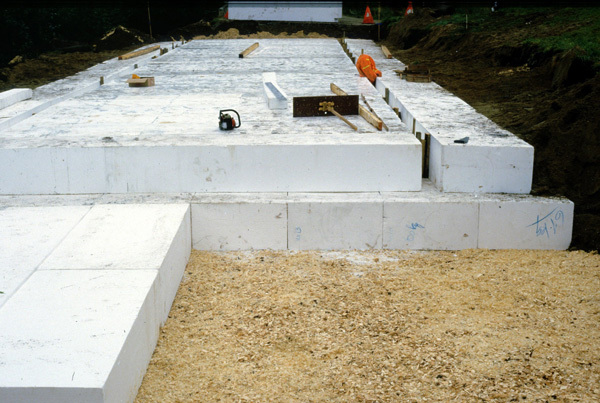 “Foamed concrete” is mixed on site by adding foam to a previously mixed concrete mortar. This is done by mixing the selected foaming agent with water in a foam generator on site to produce a “pre-foam”. The pre-foam is then folded into the prepared cement mortar in a concrete mixer to produce the foamed mortar ready for placing. This is normally done by pumping direct to the point of use. Compressive strengths of foamed mortars can range from 900 to 1500 kg/m² and are dependant on the amount of pre-foam added and the cement content of the final material. A recent development in raft construction over peat is the use of box profile galvanised steel sheeting as the reinforcing element. So far this method has only been used on forest haul roads in Finland and Russia but their results appear promising enough to warrant trials on low volume public roads. Normally 7mm corrugated steel plate is used with a zinc coating for corrosion protection. Sheets can be installed transverse or parallel to the road line. It is considered that sheets installed crosswise give a better bearing capacity and rutting resistance whereas sheets installed along the roadline appear to be better at dealing with longitudinal depressions and frost heave. The reinforcement of pavement layers using steel mesh is now a well established science following research carried out under the EU REFLEX project “Reinforcement of Flexible Road Structures with Steel Fabrics to Prolong Service Life” (1999-2002). This project had the objective of developing technologies for road reconstruction and rehabilitation using steel reinforcement to improve ‘whole life’ costs of roads and extend the working life of road pavements. 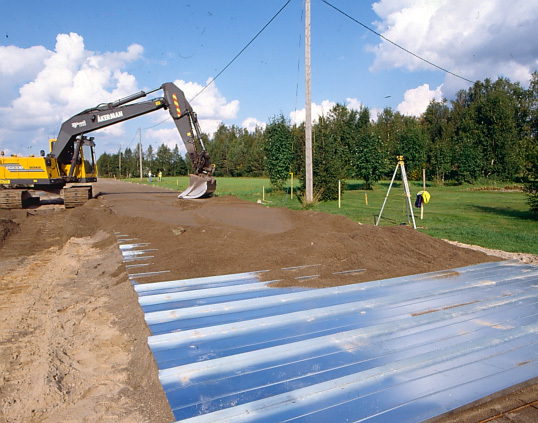 ROADEX recommends that a steel grid should always be installed in the lower layer of a road structure over peat. This helps stiffen the structure and improves its load distributing properties by tying everything together. The steel grid should extend over the full transverse width of the road without joints (i.e no joints parallel to the line of the road). Experience has shown that cracks will develop at such longitudinal joints or at the ends of the grids. Designers should therefore ensure that the grid extends the full width of the road. Transverse joints between adjacent grids along the road may be lapped or unlapped. Finland does not lap these joints, Scotland laps them sometimes. Steel grids over culverts, pipes or cables may cause problems for future maintenance operations and should be omitted at these locations or carefully designed to prevent future problems. The primary function of vertical drainage is to shorten the porewater drainage paths in a soil and produce a faster primary consolidation with an earlier gain in strength. In a normal embankment, without vertical drainage, the excess pore water pressures have to migrate substantial distances before they can dissipate. With a vertically drained soil the maximum distance to a drainage path is half the horizontal distance between the drains (normally 1.0 - 1.5m). This short drainage distance between the bands means that any excess pore water pressures can be released more rapidly from the peat thereby quickening the transfer of the embankment load to the soil skeleton. The installation process normally consists of a grid of drainage elements (usually geotextile bands) being driven vertically into the soil by a mandrel which is then retracted leaving the drain in place. Vertical drainage in peat is generally only necessary for the more amorphous types of peat and particularly when these are underlain by thick clay layers. Fibrous peats can usually be expected to dissipate any excess porewater pressures quickly enough without having the need to resort to additional vertical drainage acceleration measures. The normal process involves laying a surface layer of free draining material to acts both as a working platform and horizontal drain. The vertical drains are installed through this layer in a triangular or square pattern, of which the square grid is generally the easiest to control but has the largest drainage path for equal centres. As the soil mass settles the band drains buckle within the soil with the result that it is normal to calculate the drainage and consolidation rate below the embankment using the “buckled drain discharge capacity”. This is usually taken to be around 75% of the normal discharge capacity. Piling is not normally used for low volume road construction over peat unless settlement control is particularly critical. The method has high mobilizing costs, setting up and driving costs, and generally only comes into its own in bridge approaches and the like where settlement criteria are normally more onerous. Piling in peat so far has usually been carried out with precast concrete pile. These piles can be jointed for the deeper depths of soft soils (greater than 15m) and can be spliced by various means such as bayonet joints, wedge joints, etc. This joint must be as strong as the pile and have the same resistance to bending to ensure that no unnecessary weakness is created in the overall pile length. CFA (continuous flight auger) piles are increasing in popularity in the Northern Periphery and can be very competitive with good production rates. The piles are formed by boring a ‘continuous flight auger’ into the ground that supports the sides of the hole with the soil within the auger. When the auger reaches the required depth a sand-cement grout or concrete is pumped down through the hollow stem of the auger as it is withdrawn up the shaft. Reinforcement is placed immediately the auger has been withdrawn from the hole. 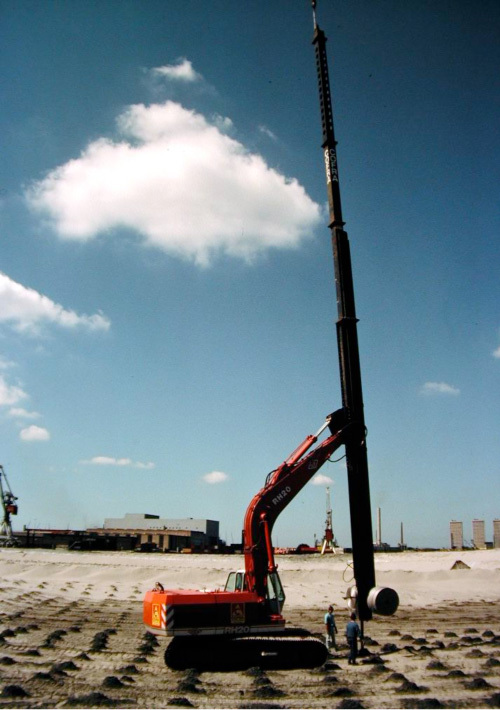 CFA piles are available from 300mm diameter to 900mm diameter and can be driven to 30m deep. 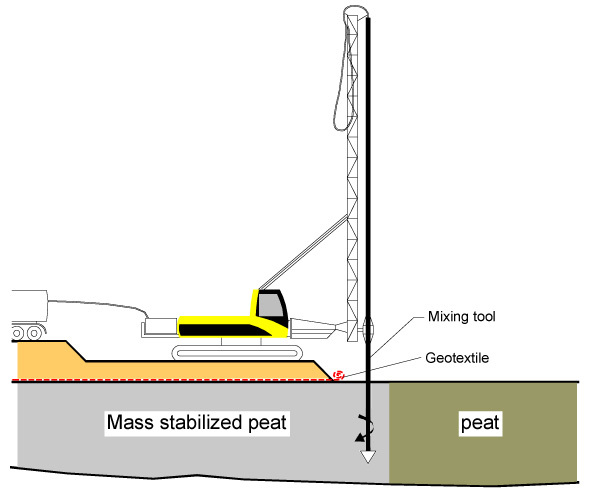 Irrespective of the pile type chosen pile groups through peat are usually topped with 1 of 3 types of cap: either a continuous concrete slab or individual concrete pile caps or a geotextile/concrete cap combination. Good practice normally requires a pile group to be self supporting, i.e. as if the peat was not there at all and ignoring any side resistance which may come from the peat. Inclined piles, sometimes called "raking piles", are used to give added horizontal resistance where the completed pile installation is expected to be affected by horizontal forces. 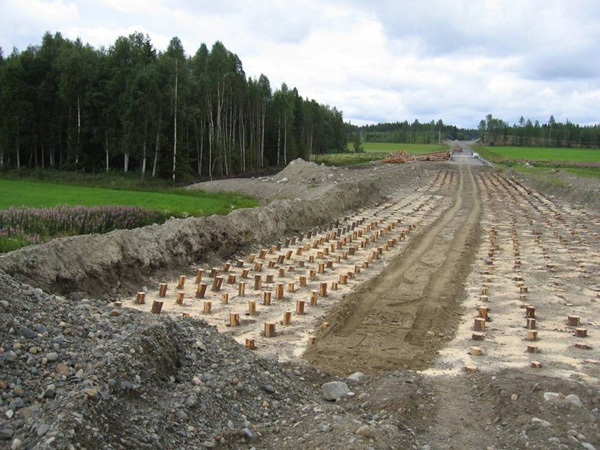 Finland uses 2 or 3 rows of raking piles in all piled embankment installations as it is considered that future loadings on the adjacent peat could result in horizontal forces on the piles. Geosynthetics can also be used as pile caps and design philosophies are now available which matches size and centres of caps to suitable strength geosynthetics fabrics to produce a ‘load transfer platform’ rather than a rigid concrete slab. In this process the ‘load transfer platform’ usually comprises one or more layers of geosynthetic reinforcement and aggregate laid across the tops of the pile caps under the base of the proposed embankment. As the embankment is constructed layer by layer on this 'platform' soil arching occurs across the pile caps that transmits the embankment load into the piles and down to the firm layer. 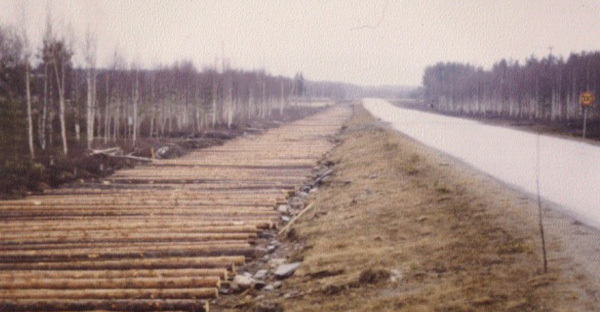 Timber piles have been used for low volume roads over peat in the past and recently they have been gaining in popularity in Sweden as a method of settlement reduction in clay and silt. They could therefore play a similar role in locations where peat overlies clay or clayey silt. Timber piles have also been used on forest roads where the availablity of cheap timber on site makes the method extremely attractive and cost effective. Mass stabilisation is a relatively new technique in road construction over peat and to date only Finland and Sweden have trialed the method within the Northern Periphery. So far the method has been used as a means to improve the strength of the underlying soil in order to improve its bearing capacity and increase embankment stability but the method can also have the secondary benefit of reducing settlement time and horizontal displacement. These have not yet been fully explored. The philosophy behind mass stabilisation is relatively simple. The weak peat is mixed together with a binding agent, usually cementious, by a mechanical mixing tool to produce a stronger and stiffer stabilised block. During the process a dry binder is fed to the mixing head with compressed air and the mixing head rotated vertically and horizontally through the peat mass. Here the binder reacts chemically with the pore water in the peat and cures to a cementious mass. So far mass stabilization projects in the Northern Periphery have been carried out using a mixing tool mounted on an excavator boom. 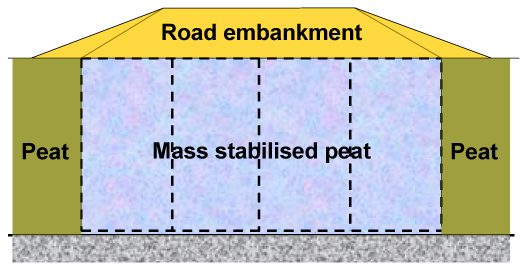 A typical stabilized ‘block’ in road improvements normally comprises 8 to 10 square metres in plan and 3 to 5 metres in depth and is usually surcharged with 0.5m to 1m of fill material immediately after the completion of mixing to compress the stabilised material and increase its strength. This surcharged area in turn acts as the working platform for the machine for the next section. The strength of the stabilised soil depends on the type and quantity of binder as well as the properties of the natural soil. A typical undrained shear strength for stabilised peat normally lies within the range of 50 – 150 kPa. 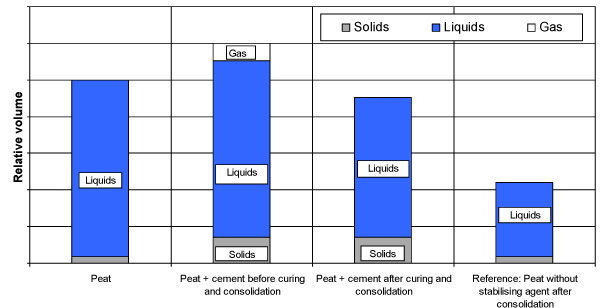 The Figure below shows some typical peat constituent components and volumes in the various stages of a stabilisation project. The figures shown were measured in Swedish case history Sw7, Road No 44 between Uddevalla and Trollhättan. As already mentioned, the decision on the final choice of method will invariably be determined from a range of considerations, from environmental through to ease of construction, as well as the performance requirements of the finished road. Cost will however be a consideration and the following table, an example from Sweden, gives an indication of the relative costs of some of the methods available. These different methods will however give quite different final road products and the costs for maintenance of the completed roads will vary depending on the form of road achieved. The relative maintenace needs of the range of types of roads on peat is beyond the scope of this lesson and all that can really be said is that the likely future maintenance needs should be one of the factors that should be taken into account when deciding on a project involving peat.